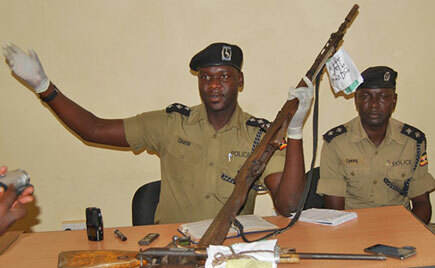 ARUA- Police in Arua have recovered a gun earlier stolen from one of their officers who was on duty. The gun was stolen on the night of November 30, 2018, while SPC Inziku John was on guard at the Electoral Commission office. It was Tuesday night that the gun was recovered from thugs by police patrollers. At the time of its recovery, the gun was in a sack with 1 magazine, a panga and a knife. The sack was thrown down by thugs after being intercepted by motorized pat-rollers at around Arua Hospital gate at 2: 00 am. “We want to assure the public of our continuous commitment to secure them in this festive season and also urge them to be always vigilant,” West Nile Region Police Spokeswoman Josephine Anguncia said.